Who doesn’t want a 2 ingredient breakfast? 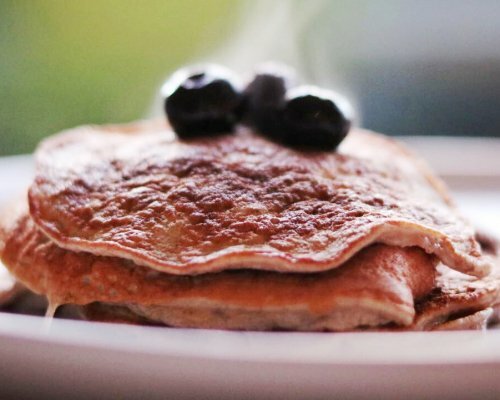 These delicious 2-ingredient banana pancakes are much healthier than your average pancake recipe. They take minutes to cook and are perfect topped with fruit, nuts and seeds and are packed full of protein. A great way to start the day. I make these pancakes small, like drop scones so they're easier to flip. Tip: We keep the pancakes warm in the oven whilst I make a batch up. Put 1/2tsp coconut butter or butter in a pan on a medium heat. In a large bowl, mash the banana or grate the apple. Add in 2 whisked eggs and mix together. Add in the baking powder and cinnamon if using. Spoon the runny mixture into the pan - you can fit about 3 small pancakes at a time in a regular sized frying pan. Serve with toppings of your choice - berries, seeds, nut butter - whatever takes your fancy.